Concrete Wraps adds durable layer of protection around your existing round concrete columns, protecting both your column and vehicles from collision damage. Increases the visibility of columns to help avoid collisions altogether. 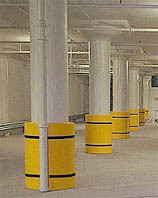 ALSO KNOWN AS: concrete column guards, concrete wraps, bollard guards, concrete bumpers, cushions, shields.